March is also National History Month, making it the perfect time to explore and celebrate our past. Lastly, St. Patrick's Day festivities have always been a favorite of mine, and About Faces supplies the best entertainment you can hope to have fun with!. Once upon a time, there was a leprechaun named Lucky*. Ironically, this leprechaun happened to be awfully unlucky, for poor Lucky had to abide by the Leprechaun rules. Every rainy day she had to leave pots of gold outside. She was very poor. She dearly wanted to pursue her dream, to paint rainbows everywhere, even on faces (like some face painters About Faces has on their website--go check them out)! But it was not to be. One day, Lucky's friend Patty told her about an entertainment agency that employed face painters. Soon, Lucky was enjoying herself as the shortest face painter hired by About Faces. *Names have been changed to respect the privacy of our shortest face painter. The event went well. The kids all had a wonderful time. Alex H is wonderful with the children. I would book with About Faces again. 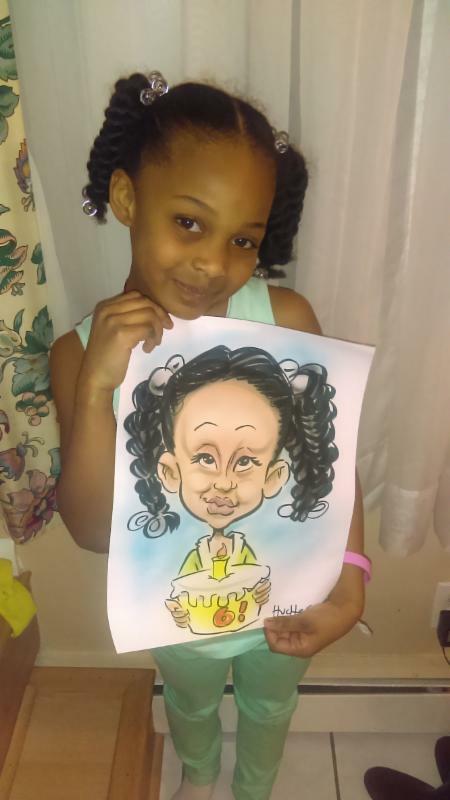 Here is a picture of the birthday girl with her picture. Thank you SO much.